Store your essential data securely on the Canvio Alu and access it quickly and easily through SuperSpeed USB 3.0. With its elegant aluminium casing â€“ available in gold, silver, black, metallic blue or metallic red â€“ you can stay stylish while carrying important documents and media files. Whatâ€™s more, the easy to use inbuilt NTI backup software allows you to make regular automatic backups of up to 2.5 TB of data, for added peace of mind. 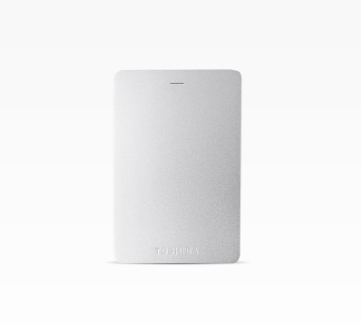 Powered by USB 3.0 technology, these portable hard drives are much faster than â€” but still compatible with â€” USB 2.0 devices, allowing for speedy transfer when organising your files. Keep all your critical data and digital memories secure with NTI Backup Now EZTM software. This intuitive pre-loaded tool automatically backs up and restores your files or folders â€“ so you can worry less and create more. Whatâ€™s more, you can schedule when and how often you want the backups to occur and even keep a complete system backup, for the ultimate combination of convenience and security.